You’re not making this easy on me, Don Mattingly. Already falling back on old bad habits in New York last week, by having Scott Van Slyke sacrifice bunt on a 3-1 count during a tie game on the road, the fifth year Dodger manager managed to one-up himself on Monday night in Philadelphia. With the Boys in Blue yet again finding themselves in a tie game on the road, only this time with the home team up to bat, it was more critical than ever to keep the bases as cleared up as possible. However, with the go-ahead runner already on 2nd base in Alex Wood’s Dodger debut, Mattingly elected for him to walk Cesar Hernandez. 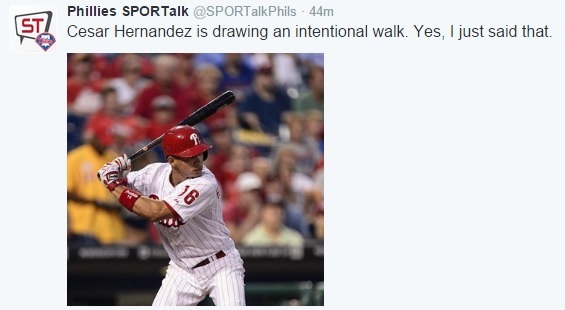 Look, I will readily admit that I don’t know enough about the current Phillies to tell you anything useful Cesar Hernandez, which is exactly the point. If a player is not easily identifiable outside of his own fanbase, he’s probably not worth a free pass. Moreover, any time a manager DOES order an intentional walk, it should be in an urgent situation- a franchise player at the plate, or last licks with an open base, or the pitcher on deck with two outs, and so forth. What it should NOT be is for the SOLE purpose a lefty-lefty matchup, particularly when the guy at the plate is more than capable of getting himself out. It gets worse. Not only is Cesar Hernandez a considerably less worthy hitter than Mike Schmidt, he is also a considerably less worthy hitter than the guy batting two spots behind him in Phillies’ CURRENT lineup. At the time the intentional walk was issued, there was only one out. The hope here is that because these mistakes are being made in July and August, perhaps they can be prevented in October. I’m often at odds with self-proclaimed stat gurus, but I do appreciate much of their in-game approach, particularly their aversion to intentionally giving up outs, or intentionally awarding baserunners. Hopefully, Andrew Freidman’s crew is on it, because someone’s going to need to get through to the man known as Donnie Baseball before the postseason, should the Dodgers be good enough and lucky enough to get that far.